Contemporary Romance / "Southern Women's Fiction"
I love this cover. It's bright, summery, and sweet. 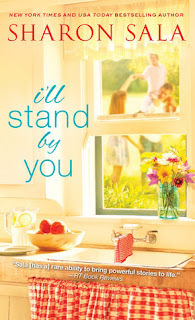 I'll Stand By You was presented to me as romance through Netgalley, but the author's blog calls it Southern women's fiction, and I think that's a more apt genre (also a heckuva lot more specific!). There *is* a romance here, but it's sudden, and quiet, and borne out of necessity and surprising intimacy rather than something more traditional for a romance novel. The romance is also between two very young individuals, twenty-year-old Johnny Pine and barely eighteen-year-old Adorable "Dori" Grant. Now, I'm all for describing the strength and adaptability of young people, particularly those who have faced hardship and rise above it, but there were some aspects of the story that made me uncomfortable because of Dori's young age. The, ah, love scene, I'll call it, just... made me want to not read, to be honest. I'll Stand By You is also a book where things start at not-so-hot and rapidly go downhill. Awful events and circumstances pile on top of each other until I was shaking my head at how bad things could get. I appreciated the way that the book highlights the trouble of people not living the values that they espouse, but also that group mentality of, 'someone else will help,' but no one actually does. What I found difficult about the plot (other than Dori's age) is that the pacing is very slow, particularly at the beginning. Things do start to snowball out of control, but at times the positive moments were so few and far between. There was little time for relief (though the kids do provide some lighter moments). This story is also a lot about the community response to the situations that Dori and Johnny find themselves in, and so a large number of characters are rapidly introduced in the first few chapters--so many that I couldn't keep track of them easily, and that I found that part of the book particularly slow. Things do pick up across the book, and the characters become more familiar and easier to distinguish, but I don't know that I would have kept reading if I hadn't been reviewing this title. I also found some of the, ah, karmic payback that happens towards the end, was just over-the-top. Maybe it's meant to balance the overwhelming negatives that happen over the book, but it just didn't work for me. Read I'll Stand By You as 'Southern women's fiction,' for a story more about community and family struggle rather than for the romance, and you might be more satisfied than I was!